Chutzpah had her third litter on President's Day (February 16), 1998 -- two beautiful babies, named Madison and Jefferson in honor of the holiday. Harry is the proud papa. 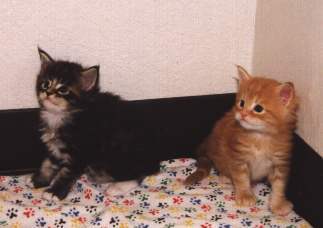 At left is Madison at just under 4 weeks of age. 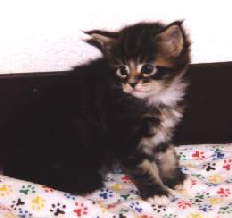 Madison is a brown tabby and white female who now lives with her owner, Ross, in Bellevue, Washington. Jefferson is a red classic tabby male, who now lives in Florida with his owner Merritt Jensen and his (unrelated) "big sister", Rosie (Pinecoon's Wild Rose). 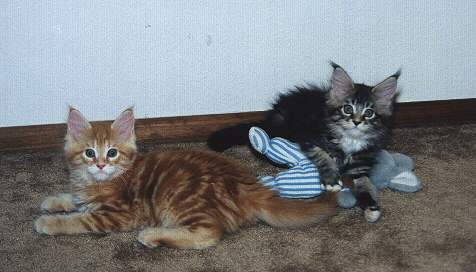 Jefferson & Madison are pictured above at about 11 weeks of age, happily abusing one of Katie's stuffed animals.